Are you bored of chatting with friends and relatives? You can have some wonderful time while video chatting with strangers from all over the world without disclosing your identity. This is a best alternative for facebook video chat, Google Hangouts that only permit chatting with your friends.You can make new friends or just kill some time. ChatRoulette is another good website to chat with strangers. This is created by the Russian school boy. There is no age limit and registration required to get start with this. This web based application uses peer-to-peer connection. You can also report the inappropriate videos and users, which is the good feature of this site. TinyChat is the fastest growing network over the internet. In this you can make friends and also can chat with strangers. You can also create your own chat rooms to have private conversation with people from all around the world. To get started with this you must have latest adobe flash player installed on your PC. You can Sign in via your Facebook and Twitter account and share YouTube videos as well. LolliChat is the best alternative of Omegle and ChatRoulette. In this you can chat with strangers with no age limit and registration. This will randomly select your partner. This will automatically delete all your chat logs when you disconnect. 6Rounds is the only online website available on the internet where you can do more than chatting with strangers. Here you can play online real time games, Listen Mp3 songs, Watch youtube videos and Intract with facebook friends as well. The only limitation of this site you have to register yourself to get started and you must be atleast 18 years old. There are lots of another websites on the internet but these the best sites that we have ever experienced for chatting with strangers online. 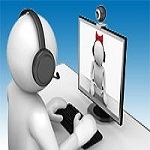 Great, You can do more desi video chat on tohla india (tohla.in) without registration . you can enjoy doing video chat on tohla.in with ajnabees, where you can meet any random ajnabee's.